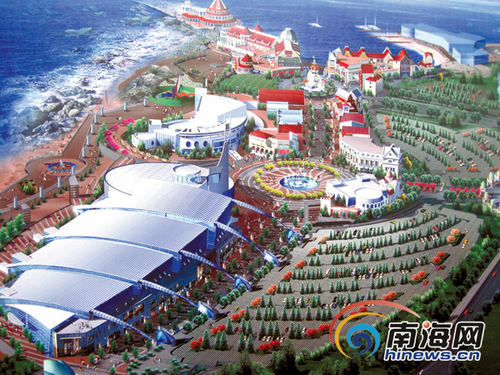 Qionghai Polar Ocean World, as an integrated tourism project and a major base of Bo’ao business conferences, started construction at the Binhai Avenue, Bo’ao Town on December 30. With a total investment of 5 billion yuan by Dalian Haichang Group, the project has a land area of 2,950 mu including the construction area of 760,000 square meters. The project is composed of 5 functional areas including the Polar Ocean Animals Museum, Fisherman’s Wharf, Hongshitan Park, holiday apartments and a sports park. Among them, the Polar Ocean Animals Museum will be built into a theme park combining polar marine animals display, animal performance, polar scientific information zone and polar experience exploration. Fisherman’s Wharf is scheduled to be built into a sightseeing tourism zone combining European-style culture and the custom of fishermen.